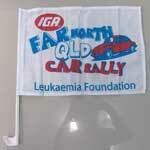 Car Flags Are Still One Of The Favoured Advertising Items. 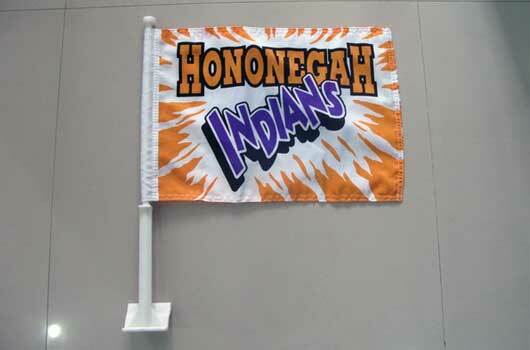 We make and supply 2 types of car flags with 2 different car flag poles. There are different grades of are flags and depending on how the car flags are going to be used will depend on which type you should choose. Car flags can either be 1ply (single sided) or 3ply (Double sided 3 layers ), 3ply make the flag heavier so it is recommend you use a stiff pole. This size is the only side that fits our poles. These car flags are really made for frequent use and going no faster than 45kmh. They are the best option for promo companies for giveaways because they are a low cost advertising item. 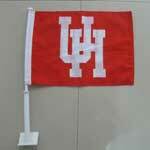 30cm x 45cm Premium car flag single sided with knitted polyester with 50cm stiff pole. 30cm x 45cm Premium car flag double sided 3 layers with knitted polyester with 50cm stiff pole. These car flags are the premium version they will last longer and can be driven at higher speeds up to 80-90km.